Have you ever searched relentlessly for that one scarf, but couldn’t find it anywhere in your closet because it was too messy in there to even see the ground? We know it may sound like a daunting task at first, but this week, we are challenging you to clean out your closet. Devote one hour to going through the boxes and clothes hanging-up, and decide what you need and what you don’t. You can even blast some music and turn it into a fun cleaning party. Why should you take time to clean out your closet? Clutter distracts us and bombards our minds with excessive stimuli, which can easily stress us out. As humans, we tend to prefer white spaces and organized structure. Clutter can inhibit our creativity and productivity by invading these open, white spaces. Although it may sound counterintuitive, it’ll actually help you save time in the long run. June Saruwatari, an organizing expert and author of Behind the Clutter, explains how, “every six minutes, people lose 15 seconds searching for items they can’t find.” Cumulatively, that can save us hours over a long time span. By going through the items and creating a streamlined closet, you’ll know that every thing in your closet honors the truth of who you are. 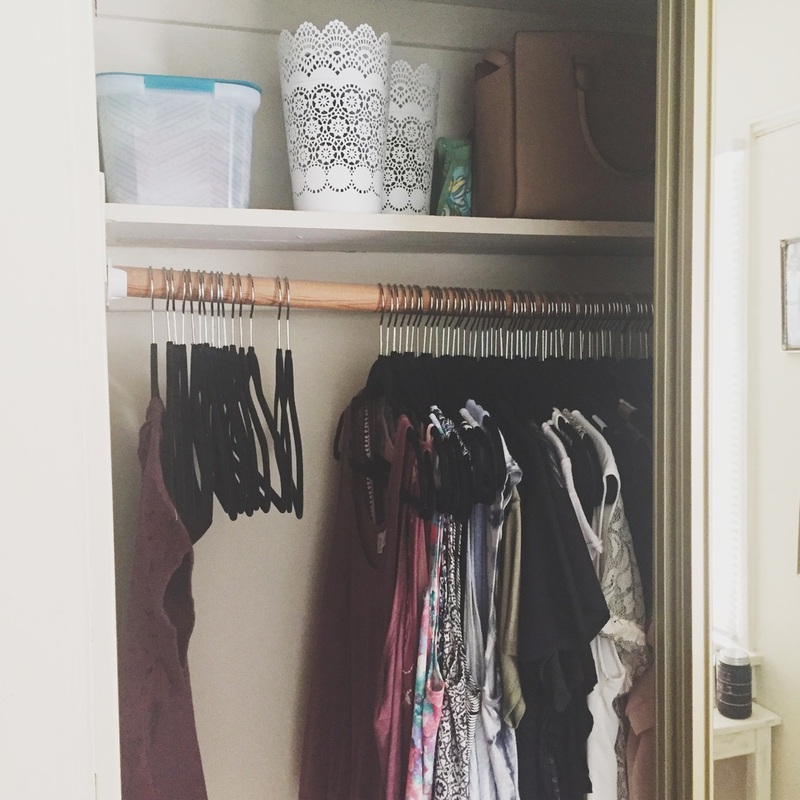 Not only does a clean closet save time, but it can also save us money according to pgeveryday. When we de-clutter our closets, we realize how much stuff we actually have. For example, next time you go out to the mall, you won’t feel the need to buy a third pair of white jeans because you found your other two pairs. Sorting and grouping clothes is really important for not over-buying new clothes impulsively. Cleaning out your closet and other parts of the house can even reduce stress. We know when we have items everywhere, it’s easy to misplace items and get stressed easily. Care2.com explains one article, published in the British Journal of Sports Medicine, which stated that twenty minutes of activity, including housework, can directly cut anxiety and stress by as much as 20 percent. Who doesn’t love the feeling of a clutter-free house and closet? Listen to more of her tips and the full podcast here: podcasts.com. There is a best-seller in Japan, Germany, and England called The Life-Changing Magic of Tidying Up. This book is by the Japenese cleaning consultant, Marie Kondo, who encourages the little-by-little approach to organizing a house. That's why this week, let's just focus on our bedroom closet! Kondo asks us to ponder which items "spark joy" and which do not. We must get rid of all items that do not spark this joy. The overarching question he posits is, "Am I having trouble getting rid of this because of an attachment to the past or because of a fear for the future?" A tidy home leads to the inspiration of a calm and motivated mindset. Additionally, according to the principles of Feng Shui, clutter can drain us of our positive energy and we can feel this energy diminishing and thus feel less motivated. If you're feeling a little overwhelmed thinking about cleaning out your closet this week, home-storage-solutions is a resource that you can use. The website talks about assessing the amount of space we have and narrowing down the tough choices in our wardrobes to make room for what's important. There’s no point in holding tight to items you will never wear. Cleaning out your closet is a perfect way to pass clothes down to family or friends. If you’re looking to make some money, you can always sell clothes you no longer wear to a seoond-hand clothing shop, such as Plato’s Closet. Another option is donating clothes to a shelter. Other people could really benefit from clothing items that no longer bring value to your life. Let's all Be Better this week and clean out those closets. Carve out one hour this week to devote to this task and we promise you'll feel better afterwards.